The following informations are from: Takamiyagi Shigeru, Shinzato Katsuhiko, Nakamoto Masahiro: Okinawa Karate Kobudo Jiten 2008, pp. 435-37. In 1937 Shimabukuro Eizō studied Shōrin-ryū under Kyan Chōtoku and Gōjū-ryū under founder Miyagi Chōjun. For the following 70 years he walked the path of karate. With ten thousands of domestic and foreign disciples he was particularly successful in training US military personnel stationed in Okinawa. Thanks to these, Shimabukuro was able to significantly spread karate in the United States, where his popularity is extremely high. His reputation can be seen in the large kumite photo presented on the cover of the famous US karate monthly magazine “BLACK BELT” (June 1983 issue, story pages 20–24). 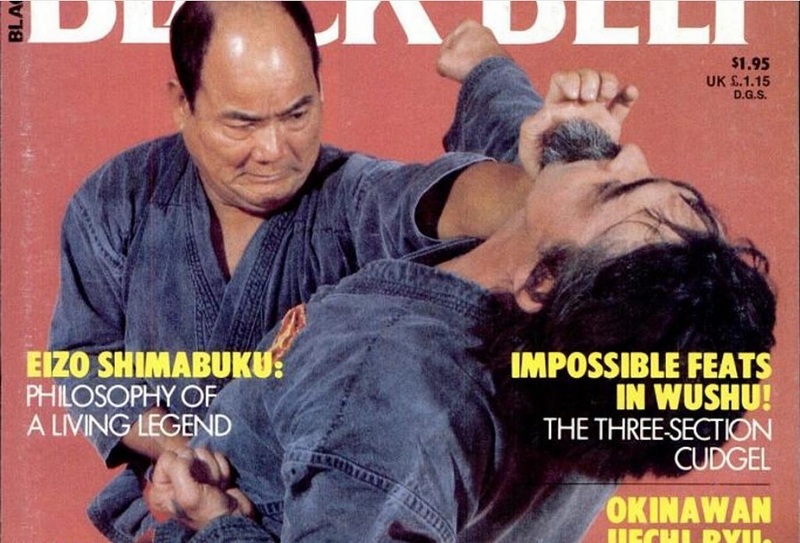 Shimabukuro Eizo in “Black Belt”, June 1983. The Shimabukuro family was blessed with 10 children, of which Eizō was the youngest. During childhood he was shy and had a weak physical constitution, so his parents were much worried about him. Believing that this is not proper for a decent human being, his uncle Ganeku Shinkō, who had studied the Shuri-te under Itosu Ankō, partly forcibly taught karate to the boy Eizō and by the time he had achieved basic physical strength he recommended him to Kyan Chōtoku and Miyagi Chōjun. Studying under both these teachers, Eizō became crazy for karate and by a physical and mental self-transformation took on a robust physique and a firm character. In “firmness of character and simple humanity” he was able to become a man of a strong and unselfish will. Eizō is revered by many as both an extraordinary warrior and a common everyday person. His personality of being indifferent to worldly gain also fascinates all sorts of people. His daily life followed the motto of “Raising the will high, but remain common”, which might best be understood as being a warrior as well as a human being. Eizō never ceased to love and respect every day his older brother Tatsuo. Tatsuo would later establish Isshin-ryū Karate-dō. Eizō received a huge amount of training from his older brother and both came to be prominent warriors known to posterity as the “samurai brothers” (busā-chōdē) who directly inherited the art of Kyan Chōtoku during the prewar Shōwa era until 1945. In friendly competition with each other, persevering through the severe training and later accepting their own disciples, both later achieved the highest rank of hanshi 10. dan. Following the Japanese defeat Eizō also studied under the kobudō expert Taira Shinken and also came to be known as a leading expert in this field of study. In 1958 Eizō established the Okinawa Shōrin-ryu Karate-dō Kokusai Renmei (International Federation of Okinawa Shōrin-ryu Karate-dō) and fulfilled his duties as its president. And in 1962 he was awarded hanshi 10. dan by the old Zen Nihon Karate-dō Renmei (old JKF). Thereafter he opened dōjō in Gushikawa City, Okinawa City, Kin etc. and spent every day teaching the juniors. In Okinawa, with talented representatives such as Shimabukuro Eikō (oldest son) and Shimabukuro Eiji (second oldest son), Kyuna Chōkō (director of the Risshikan dōjō), Inamine Seijin (Ryūkyū Shōrin-ryū), Isa Kaishū (Ufuchiku-den Ryūkyū Kobudō Hozonkai), Komesu Gishū (Meiō University), Toguchi Shūkō (Chan Shōrin-ryū) and others, Eizō’s personal pupils span ten of thousands at home and abroad. Among the many talented persons in the United States are Joe Lewis, Jerry Gould, and Diana Gould, forming a hidden force within the United States karate circles, where he is referred to as ”Grand Master Shimabukuro”. Eizō made full use of teaching promising talents from among the enormously influential United States Marines. In 1974 he visited the United States on invitation and showcased the essence of authentic karate during seminars on karate and kobudō. Thereafter, he successfully led more than 20 special workshops in overseas. “In Okinawan karate as a lifelong budō, man and women of any age are trained in the unchanged instruction system of traditional kata, by which the techniques of the masters are polished through the eras. This is because karate has been handed down as a cultural heritage of martial art”. Eizō’s belief is that karate begins with kata and ends with kata. This emphasis on kata is represented by his way of teaching. In order to continue and to maintain the purity of the Shuri-te-style Shōrin-ryū-kata inherited from Kyan Chōtoku, he also studied under Chibana Chōshin regardless of the long journey. Eizō was also an initial advocate of armored kumite matches. To ensure the mental and physical safety he took great pains considering himself with educational questions and testing his ideas in numerous championships in the 1960s and 1970s. The result was the establishment of today’s armored kumite matches. 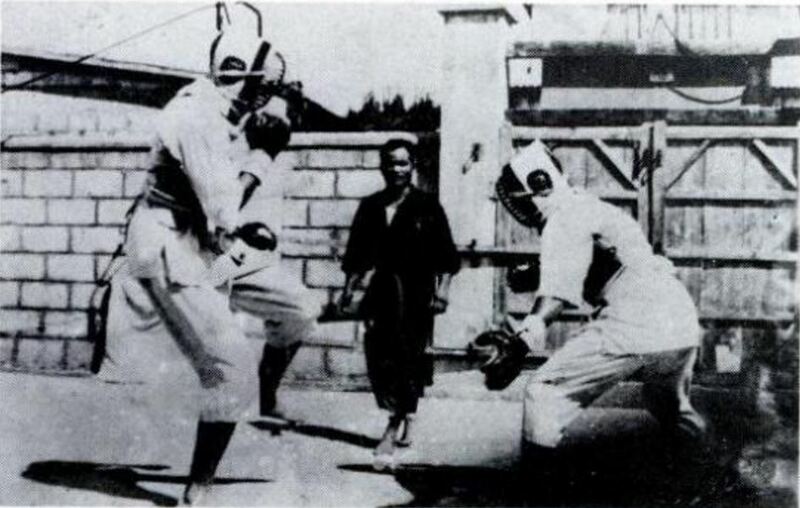 Eizo leading a sparring match around 1958, seemingly using the gear developed by Tamotsu Isamu and the Renshinkan Shorinji-ryu. It was created in reference to Kendō protective gear, but for the use in Karate, with raw materials mainly being cloth and leather. There were many problems such as safety issues due to cracks, sanitary issues like becoming moldy, heavy and hard to move with, old design, and its high price. As a public figure Eizō is known as a “strict warrior” of simple honesty and a heart of iron. But as a private person he is known to be purely tender-hearted, caring person known for his cordial behavior. Today at old age he is a good-natured and refined old gentleman with a liking for his bonsai hobby and enjoys life along the motto “every day is a good day”. His eldest son Eikō followed Eizō as a master expert of karate. Active at home and abroad he opened the Shōrin-ryū Shinbukan dōjō in Okinawa City Yamazato in 1980, where he devotes himself every day to the instruction of his juniors. Today he serves as the vice-president of the Okinawa Shōrin-ryū Karate-dō Kokusai Renmei. Sanchin, Sēsan, Naihanchi (I – III), Anankū, Wanshū, Pinan (I – V), Chintō, Passai, Kūsankū, Seyunchin, and Gojūshiho. Eizō’s second daughter Ritsuko opened the “Shibiki Ritsuko Ryūbu Dōjō” of Ryūkyūan dance in Okinawa City. Her younger sister Shiragi Michiko also studied the Miyagi-ryū and opened the “Shiragi Michiko Ryūbu Dōjō”. Both sisters teach the secrets of Ryūkyūan dance. Armor used in the Renshinkan of Shōrinji-ryū. 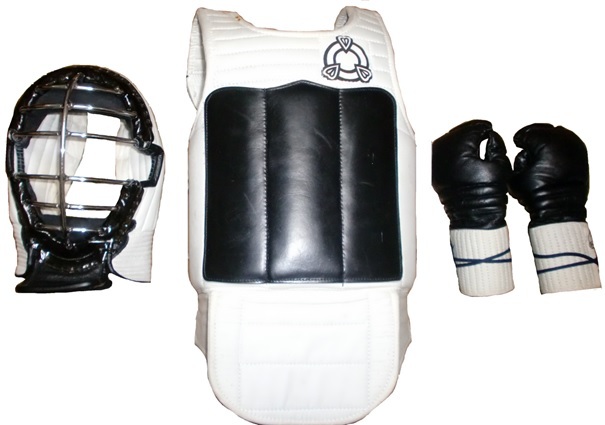 Except for protective gear borrowed from kendō or baseball, this is the oldest type of armor that was specifically developed for use in karate kumite. From left: head protector (men 面), chest protector (dō 胴), hand protector (kote 小手). Sometimes shin guards were also used. This entry was posted in Kyan Chotoku, Misc, Unknown Ryukyu and tagged bogu kumite, bogu-zuki kumite, Isshin-ryu, Kyan Chotoku, Shimabuku, Shimabukuro Eizo, Shimabukuro Tatsuo, Shorin-ryu, Shorinji-ryu, Tamotsu Isamu. Bookmark the permalink.